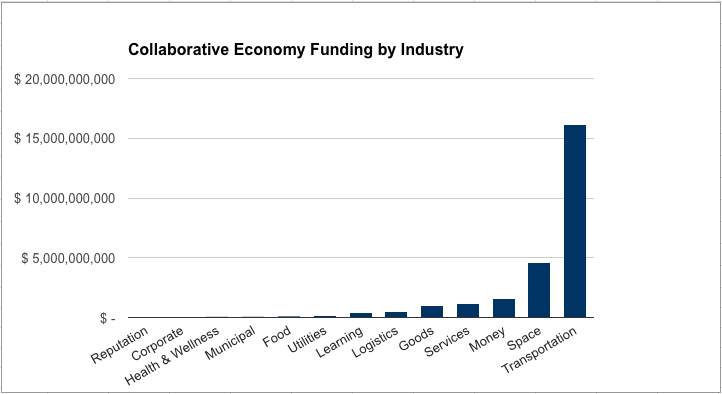 By our count, the Collaborative Economy has been funded $25 billion, one of the highest funded tech industries, ever. For comparison, global social networks have been funded a mere $6 billion, which is just a quarter of the Collaborative Economy. Within the $25 billion funded, $13 billion has been invested in the transportation space, which is 52% of all funding dollars. What’s shared transportation? Chances are, you’re already using it. First, let’s define the category of shared transportation. It includes: 1) rides as a service, and 2) vehicle sharing. If you’ve taken a ride as a service like Lyft, Uber, Ola, or Didi, you’ve participated in shared transportation. If you’ve experienced ridesharing or carpooling with startups like BlaBlaCar in Europe, you’ve also participated. If you’ve borrowed a car from a peer using startups like RelayRides, Getaround, or a boat from Boatbound, Sailsquare, or Boatsetter, you’ve participated in sharing vehicles. Five startups in Europe, India, China, and the USA are receiving the funds. How is this $13 billion of funding distributed? First of all, it’s hard to fully calculate, as some of the debt financing to Uber makes it difficult to truly tabulate. Here’s a breakout of the top startups: Uber more than $6B; China’s Didi more than $4B; Europe’s BlaBlaCar more than $2B; America’s Lyft more than $1B (who partnered with Didi); and India’s Ola Car more than $600K. These startups lead the overall top-funded tech companies, even across multiple sectors. See full stats on this multi-tab Google sheet. Above Graphic: The Collaborative Economy has been funded over $25B, but $13B (53%) has gone to the transportation sector, see full multi-tab Google sheet for more details. Most people will live in big cities. Multiple urbanization studies indicate that most of Earth’s population will reside in large dense cities, many inside of “Megacities” which have more than 10 million inhabitants. The rise of the population, and the density that comes with it, means that shared vehicles and shared rides are inevitable. Vehicles are mostly idle. Vehicles, whether they be autos, boats, or trucks, are some of the least used assets that we own. We’re often in our homes a third of the day, but vehicles are only used 5% of the time or less. These idle assets that clog up parking, streets, and neighborhoods can now be activated in car sharing, reducing the number of cars on the road. They’re expensive assets. Many view vehicles as depreciating assets, or in some cases, liabilities that require payment plans, insurance, gas, maintenance, parking, and more. For those in an urban environment, the costs can increase even further with storage costs, parking tickets, and more. An easily shareable asset. Unlike personalized clothes, perishable food, or seasonable sporting goods, autos and mobility services are easily shared from person to person. In most cases, humans can interchange seats or vehicles as easily as they change their daily outfits. Positive sustainability impacts. Investors like Structure Capital, Collaborative Fund, and Sherpa Ventures have shared their investment thesis in the world demonstrating their commitment to reducing waste, making the world more efficient, or helping communities. Extends value to other industries. The transportation space isn’t limited to just the value of cars or taxis, but extends its impact to many other industries, including: 1) Logistics, shipping, and storage; 2) Personal services like retail delivery, home cleaning, and other on-demand services; and 3) Impact traditional car loans, insurance, and more. Immediate revenue generation. If there’s one thing that makes this category so attractive to investors, it’s that each transaction generates 10-15% cash flow to the tech startup. Unlike struggling social media startups who are still searching for their revenue models, this market generates direct revenues for every transaction –- with low costs. This is just the start of the shared transportation space. Other players like Google are expected to enter this space; telecom companies like Verizon have launched auto sharing applications; and BMW (client), Daimler, Ford and others have launched car sharing programs, which all spur the movement forward. Furthermore, self-driving cars are being produced by Uber, with their recent acquisition of over 50 CMU professors to build said self-driving cars. With Apple, Google, Tesla, and other Silicon Valley heavy hitters building autonomous vehicles, they will no doubt make them available as shared services, where you can have a vehicle fetch you –- instead of you having to own one. Read more on the next phase, how self-driving cars will disrupt the crowd, here. The funding in this market is just setting the stage for much larger disruptions on the horizon.